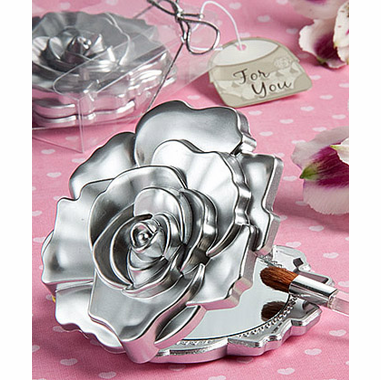 Pretty on the outside and the reflection on the inside, this rose compact mirror make perfect flower favors. Each measures 2.5" round. 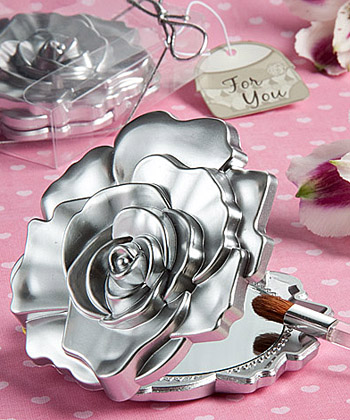 The rose design compact case is made of silver finish hard molded plastic. The cover's two dimensional molded "petals" bring the beautiful rose blossom design to life. Each compact opens at a side hinge to reveal a dual glass mirror interior with one regular mirror and one magnified for those times when you need a closer look. Mirrors are packaged in a clear box with a metallic silver rope tie and bow and an attached purse design "For You" tag. You may also purchase personalized hang tags or stickers for an additional $.35 each. If you select the hang tags they come pre-punched with a round hole and include a 5" long white elastic string (stickers and tags are not attached - assemble and apply yourself). You have your choice of tag/sticker shape - Diamond (1.75" x 1.75") or Round (1.75" diameter), background color and design. The mirrors came as expected. They are individually wrapped. I did order special labels so I had to unwrap, cut off "For You" tag, attach my tag, then re-wrap. It took some time but it made the party favor more personal, It was easy to pick my color and print for the tag. The personalized tag made the gift more personal.